This red hibiscus was hidden under a fence and bloomed for weeks. I was so inspired to capture this “Hidden Beauty” and create the original pastel painting. Now creating this beautiful Archival Digital Canvas Fine Art of my original is very exciting to me. I have hand painted the art with oil paint and oil pastel, sprayed with an Archival gloss spray that will protect the art against UV rays. The color and realism of this flower is a treat to view. The frame is a muted grey, brown with a white linen liner. This work of art measures 15 ½” X 23 ½”. This is a one of a kind piece with this frame that comes with it’s own Certificate of Authenticity. There is always a story behind each painting if you would like more information contact me directly. 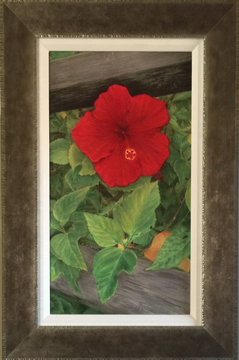 “Hidden Beauty” captures this Hibiscus shielded by the harsh sun at full bloom with its penetrating Red color. Blooming under a fence this flower stayed brilliantly red for weeks on hand. It had the right amount of sunlight and shade. Rich in color and situated in the right place gave the perfect opportunity to create the original pastel painting and this “Hidden Beauty” Archival Digital Fine Art. The way the “Hidden Beauty” Hibiscus so gently conforms to the top of the fence resting it’s pedals on the wooden fence with the lush leaves all around gives us a close up look at the organic beauty of nature at any given moment. This “Hidden Beauty” image is surrounded with a white linen liner, framed in a marbled brown gold wooden frame. The oil paint and oil pastel hand applied gives this 15 1/2″X 23 1/2″ art it own beautiful unique look. There are more different renditions of “Hidden Beauty” in my collection with different frames so you can choose your favorite. Contact me if you feel this art is for you.